Traditional Better-Gro® Wooden Baskets offer the ideal growing solution for epiphytic plants, such as orchids, bromeliads, and ferns. The thick aerial roots of epiphytic plants pass easily through the slats and adhere to the natural wood surfaces of the basket. 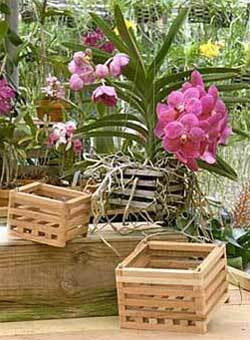 Better-Gro® Wooden Baskets allow for the perfect display of orchids with pendulous flower spikes. Constructed of recycled hardwood, wooden baskets are not only beautiful, but are environmentally friendly. The baskets feature zinc plated hardware.